Busan Beach Trip – Writing with Beau! I know this title photo is aggressive. It may make you uncomfortable. I felt uncomfortable taking the picture–knowing I shouldn’t be looking at it let alone documenting it. But it is especially pertinent, I think, to my Korean beach trip. As this man was adorning the double-up-thong, so too were many others. It was commonplace. I saw a lot of things that I had never seen at the beach before. I also did a lot of things I had never done at the beach before. This picture is indicative of the type of beach trip I had and soundly represents all that was new and unfamiliar. I had an amazing experience, and we enjoyed ourselves, but the same way you never really get comfortable being around a man in a doubled up thong, I’m not sure if I could ever buy in to Korean beach life. Applying feedback I’ve gotten for this site, I’m going to use bullet points to describe my Busan (South Korean city) beach trip. People seem to enjoy themselves more reading my words in bullet form and I think I’m more concise in my thoughts. I will employ two types of bullets concerning the events and interaction of this trip: Things I’ve never done or seen at a beach before and Things I did that would disappoint my mother. Some bullets may be appropriately labeled as “both”, if in fact I had never seen or done anything like that a beach before while knowing it would also upset Nancy. Double-up-thong: We have already discussed this adorning vestige, but it still deserved a bullet. Thongs, on men, unfortunately are a thing at beaches. But two, one upon the other, is new. I hope this trend stays in Asia. Applied tanning oil: I’ve been told, melodious voice aside, that I bear a firm resemblance to Ed Sheeran–pale skin. Typically when I go to the beach I lather myself in an SPF 15,000 or just keep a shirt on, if I’m out of shape. On this trip, in South Korea, I just assumed that UV rays weren’t a thing. I disregarded the thousands of Koreans swimming or lounging in full sleeve water wear; assuming it to be a cultural antic or a fear of arousal. Not wanting to waste a rare trip to the beach–an opportunity to bronze–I tried to exacerbate any influence of the sun upon my skin, mild it may be. After a stop to the beach grocer and fifteen minutes of rigorous application, I was layered in tanning oil. 8 hours later, in our condo, my skin surpassed bronze and settled on charcoal. I had difficulty moving until inebriation set in. “Can I borrow your football?”: Going to the beach without the pigskin, in America, is unheard of. It’s upsetting to think about. On the fourth day, an English teacher came to the beach with his lady, and began tossing around the rock (football). When they finished, I asked, “Could I borrow your football?” I have never asked that before because I would not go to the beach without a football. Footballs do not exist in Korea. I hope I never have to ask that question again. Stolen food from a child: Libby, mother to Henry, meticulously packs a travel bag for her family–particularly Henry. Henry is almost two and is the coolest. At the beach, her travel pack was even more noteworthy. I, however, am not a great packer. I also get the munchies when I drink. On the second day, midday, I was drunk and I was hungry. Darin and Libby were playing beach baseball with Henry. After forcefully and audibly clapping for Henry when he made contact with an underhand toss from Dad, so they would know I was watching them and not Libby’s travel bag, I dove to their umbrella and rifled through her rucksack until locating Henry’s cookie wafers… Again, petty theft isn’t something new to me at a beach; I’ve just never stolen from a child before. I did not list this under both, though, because I think Nancy would respect the ruthless hustle. Beer pong with a toddler: Later that evening, after we had collected ourselves and regrouped in our respective condos, Henry and his family met us at Sam Ryans, a beachside pub. He never said anything, or verbalized his discontent, but Henry was seemingly hostile towards me. I think he knew I ate his wafers. Before his parents could stop and select a booth for dinner, Henry viciously waddled to the barside beer pong table. I followed. Words didn’t really need to be spoken; I knew this was how things would be settled. Henry played with his father, Darin, and I played with my Korean friend Kevin. We didn’t let Zach play because he is bad. We played two games, in fierce battle, where Henry stood on the table and repeatedly ignored my “elbow” protests. His dad even guided his shot and drank all the beer, which I thought was bush and enabling. After defeating Henry and Darin, though, Henry and I were able to bury the hatchet. I think he respected how well I played and the way in which I competed. I also think we severely upset the Korean owners but, due to language difficulty, they never told us not to play beer pong with an 18 month old child. Shots with a homeless man: Let me clarify first that the reason my mother would be disappointed is not because of the societal status of the person I drank with–homeless–, but more the blatant disregard for hygiene and professional appearance. She is not conceited and above people, but I do not believe she would approve of me pouring alcohol in cups, secured by the sand, for a man who has clearly had issue with drinking in the past. Nonetheless, because I was at the beach, and I enjoy meeting new people, I drank beer and Soju (Korean Sake equivalent) with my friend Park Ji. Escaped a fake rifle execution: Park Ji spared me when he used an invisible air rifle–equipped with automatic-mouthing bullet sound–to execute my friends… After I gave this man some beer and a shot, he would not leave me. Talented in his consumption, when he finished his drink, he wanted another. And another. In gentle fashion, because confrontation scares me, I made several trips to the water or along the beach to shake him. It didn’t work. Park Ji was persistent and affectionately followed, calling me “my friend”. After an hour, I returned to my beach chair. So did Park Ji. He started making miming motions for drink, “mo drink.” Anthony, adjacent us, spoke in friendly-firm tone, prodding Park Ji to leave. It did not work. Anthony’s translator, Alex, and Alex’ lady, Sarah, addressed Park in Korean. Initially, they were friendly too. Park Ji idly resisted, turning to me, as if imploring for me to intervene and let these people know we were boys. Alex got a little harsher. Park Ji sprawled in the sand, across our blankets, in protest. Sarah stepped in and let Park Ji have it. Alex followed, because it seemed as if Sarah was wearing the pants. After a minute, and a torrent of Korean yells, Park Ji rolled over again–full scorpion. Finally, he got up, amidst stumble, and balanced himself. Pulling from the hip he raised an invisible rifle with both hands, right hand on the trigger, and blasted Alex and Sarah with a spray of bullets. After their execution, he turned to Anthony and delivered 10 to 15 rounds to his chest. Park Ji lowered his weapon, wiped the spit (ammunition) from his mouth, with his off hand, and delivered me a thumbs up. When I reciprocated, via wave, Park Ji turned and left. “Shark!”: I’ve played plenty of pranks at the beaches, but never one as insensitive and panic inducing as yelling “shark!” After several beers on the second day, and an absorbed anger because of painfully burned skin, I didn’t give AF. I stood at the breaking of the beach and water, where the surf rolls to its foaming retreat, and violently yelled “Shark!” Nothing happened so I yelled again, this time pointing and jumping. In simultaneous form, exactly as I realized no one could understand me and people were disregarding me, a small child walked up and poked my arm, solely to see the red skin turn yellow–as skin does when it is burnt. Over reaction to average white female: To make a mini disclaimer, I do not like to objectify women, especially in terms of the notorious 1-10 barometer. I have women in my life too important to me that I respect too much to do this. But, the only way I can depict this over-reaction is by labeling the certain women I saw, walking the beach, as physically average. I have never been at the beach before, seen a soft bodied American with coarse features, in a one piece, and whistled at her. I have never done that before because 1) it is disrespectful and 2) I was too busy staring at the olive-skinned knockout rocking a shoe string bikini. Too much time abroad, devoid of conversation in a common language, has made me this way. I am not proud of it and have never acted that way before. Thst was awesome and Im upset we missed out on that type of fun! 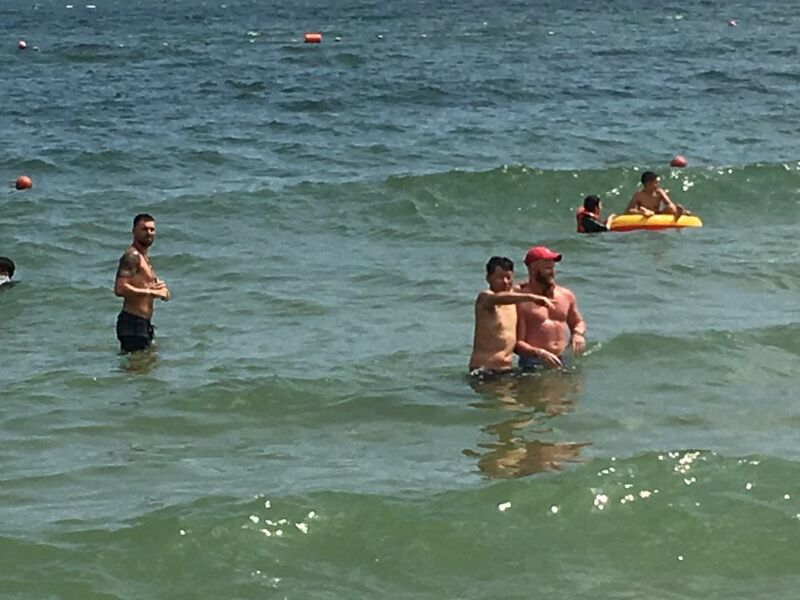 Also, you looked jacked in that picture in the water with your boy, Park-ji.